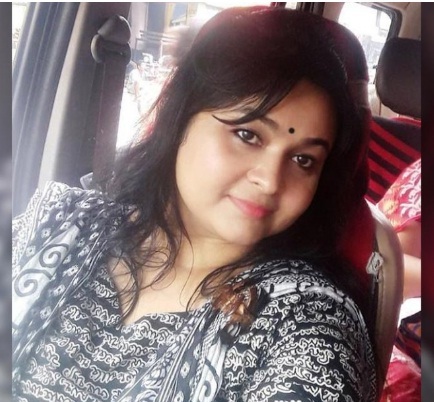 In a recent news from West Bengal, a girl named Subhalagna Chakraboraty was shot dead by a man named Mohammed Sultan Ali. Both the victim and the accused were involved in a romantic relationship in the past and finally, the victim wanted to come out of the relationship. Her parents were also beaten by iron rods by the accused while trying to save her during the altercation. Sultan has been arrested by police and parents have said that the accused hid his real name and identityinitially, while involving himself with their daughter. While this seems like an isolated personal case of a spurned lover, there are enough cases happening in the country to raise an alarm, wherein a Muslim man fakes a Hindu name, sometimes even wears a Kalava / Mauli (sacred thread worn by Hindus on wrist) just to befriend a Hindu girl, bed her or convert her. Sometimes the girls are left severely injured or traumatized or even murdered. 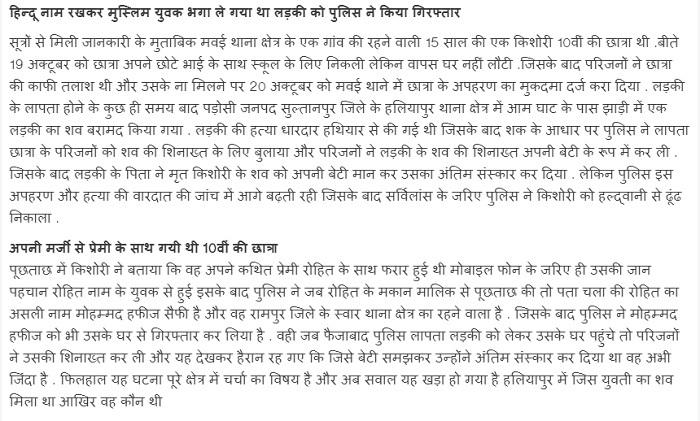 Case 2 – Muzaffarnagar, Uttar Pradesh, A Muslim man named Afsarun pretended to be Hindu and befriended a Hindu girl. For 2 years, he kept physical relations with the girl by fraud and finally married another Muslim woman. 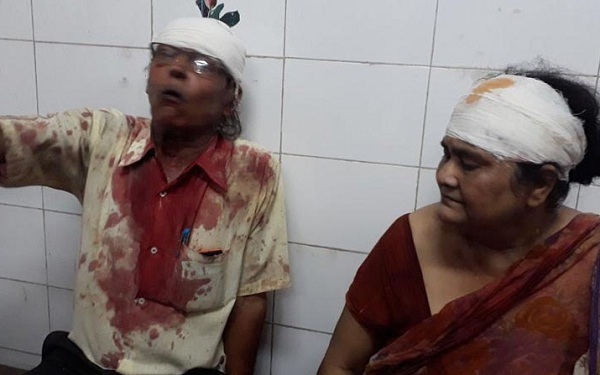 When the Hindu girl objected, she was beaten up by Afsarun and his family. Case 3 -A Muslim man named Akram pretended to be ‘Aadi Varma’ and befriended a Hindu girl , when the girl got to know his real name after almost an year, he pressurized her to keep his identity as secret and threatened to kill her too. 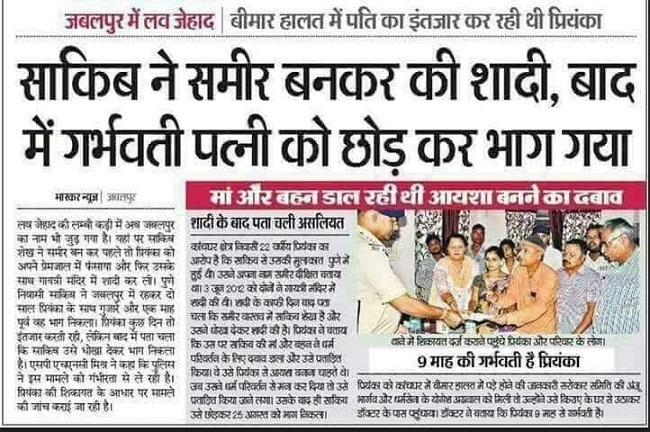 Case 4 – Jabalpur, MP – A Muslim man named Sakib faked his name as ‘Sameer’ and married a Hindu girl named Priyanka. After a long time into marriage, Priyanka got to know his real identity. Sakib’s family started torturing Priyanka to convert to Islam. When she did not give in, Sakib ran away leaving her 9 months pregnant. Case 5 – A Muslim man pretended to be a Hindu and befriended a girl named Neha. After some time, the girl got to know his real identity, and refused to marry him. That Muslim man and his friends pressurized Neha to convert to Islam, and upon her refusal, murdered her. Case 6 – Shamli, UP – A muslim man named Jasim faked his name as Kunal Chowdhary and befriended a Hindu girl. After few months, he took her to a hotel and drugged her cold drink. He revealed his identity, clicked her obscene pictures and threatened to circulate them if she opened her mouth. Jasim also threatened her brother with dire consequences. He also mentioned to the victim that faking Hindu names is a standard tactic for them to trap Hindu girls. 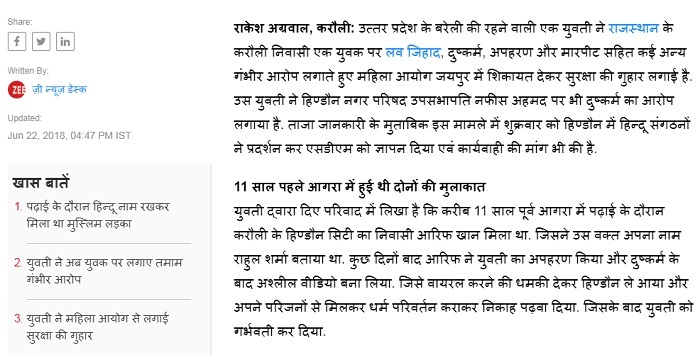 Case 7 – Gorakhpur, UP – A Muslim man named Ameen Ul Haq faked his name as ‘ Sonu Vishwakarma’ and befriended a minor Hindu girl. He convinced the girl to elope with him but the police caught them. After the police caught them, then only the girl got to know the real identity of the man. Case 8 – Karauli, Rajasthan resident Arif Khan befriended a Hindu girl faking his name as ‘Rahul Sharma’. After they became friends, he kidnapped and video-graphed her in compromised positions. She was blackmailed into converting her religion to Islam and marrying him under Islamic law. 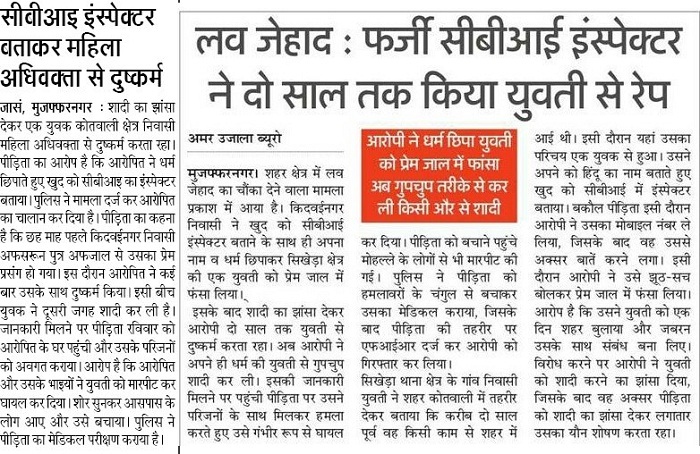 Case 9 – Gonda, Uttarakhand – A Muslim man faked his name as ‘Krishna Kumar’ and befriended a Hindu girl and her family. He married her in a local temple and after months, the woman got to know his real identity and filed a police complaint. 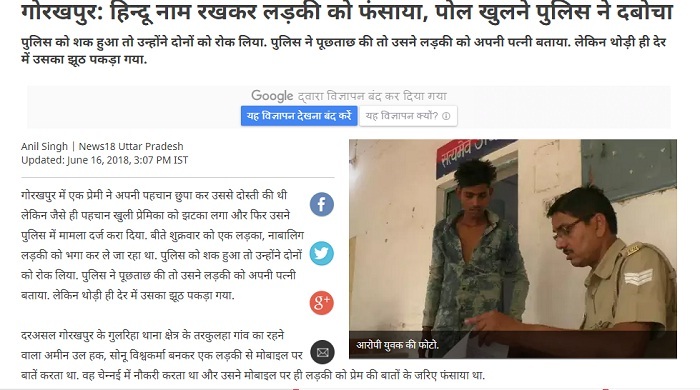 Case 10 – Faizabad, UP – A Muslim man named Mohammad Hafeez Saifi pretended to be ‘Rohit’ and befriended a minor Hindu girl. He convinced the girl to elope with him. After her family filed a police complaint, the police traced them and the girl got to know his real identity. The above are only 10 cases, which are just randomly taken out of newspapers / social media, just to present the fact that this particular tactic of faking a Hindu name is extremely rampant across various states to trap Hindu girls. The actual statistics (if available) seem to be running into hundreds of cases on a monthly basis. 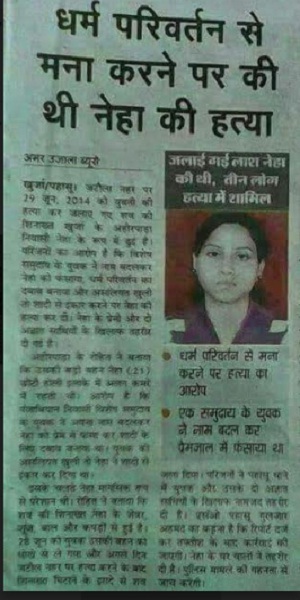 The common thread running in all the cases is the fact that Men are all Muslims and girls are all Hindu. One is compelled to make this distinction on the basis of religion as this seems to have ideological sanction as in many cases, the families of Muslim men were also involved in the fraud. Extremely sad that there is not even a wide acknowledgement of this issue in the English speaking elite sections of our society. It is difficult to fix a standard term for this tactic, appears to be Love Jihad / Grooming by fraud.